Sign up to be a Beauty Insider. If you shop at Sephora, signing up for their reward program called “Beauty Insider” is an absolute must. All employees ask you to sign up at the register and many customers think we ask everyone because we have a certain quota that we each have to make, but in fact we don’t. We’re simply asking you because the perks are incredible. Each dollar you spend at Sephora (online or in-stores) you get a Beauty Insider point and you can redeem those points for some incredible rewards. You also get a free birthday gift during the month of your birthday (no purchase necessary) and it’s the only way to get coupons for Sephora. There are also three levels of beauty insider: Beauty Insider, VIB, and VIB Rouge. The perks get better the higher you level up and once you become a VIB Rouge you get free shipping online ALWAYS, a special birthday gift, and free CMAs anytime you want! Don’t be afraid to talk about your skin issues. Especially when you’re looking for a new foundation or skincare products, you shouldn’t be afraid to voice your issues to your Product Consultant. Trust me, we literally hear and see the craziest things so your few pimples or wrinkles is seriously nothing to be embarrassed about. Also, if you tell us exactly what your skin issue is we can truly tailor your experience around finding the perfect product to do exactly what you want it to do. If you want to try something out, don’t be scared to ask for a sample. We get people in all the time who don’t plan on purchasing and just ask for samples all day, everyday and yes, it can get annoying, but if you’re truly looking to try something out and then buy it if you like it, asking for a sample is harmless. We can make samples of everything from foundation to fragrance so definitely don’t be shy! Take full advantage of the ColorIQ and SkincareIQ. If you’ve ever been looking for a foundation at your local Sephora you’ve probably been asked if you wanted to be “Color IQ-ed”. Whenever I ask, many people look at me like I have three heads and say “huh?” Sephora teamed up with Pantone and created this incredible little machine (which is essentially a camera) that takes three photos of your skin, averages the three photos together and gives your Product Consultant a number. That number will then be typed into the iPad which, in turn, shows all the foundations in the store that exactly match your skin. This makes the process of finding the perfect foundation way easier since you can also narrow your results down by skin type, coverage, finish and more. SkincareIQ works in a different way and you have to know your skin a bit before you try this out. It’s essentially a little computer where you take a little “quiz”. The computer will ask you many different questions about your skin concerns, type and more and then recommends the perfect products for you. A lot of people don’t even know that this service exists but Sephora offers free 15-minute “mini makeovers”. A mini makeover focuses on one area such as a smokey eye, eyeliner, foundation, etc. You won’t get a free full-face makeover but you do get one part of your face made over for free. This is also a great time to learn new techniques and how to use different products. …Or a full-face 45 minute Customized Makeup Application (CMA). If you’re going to an event or out with your friends for the night, stopping by Sephora for a CMA or Customized Makeup Application is a great idea. With a $50 purchase (which is pretty easy to do!) you can get your entire face made up from skincare to foundation even all the way down to the setting spray at the end. You’ll learn a ton of application techniques and things especially for your face/eye shape. In many Sephoras you need to call ahead of time and make an appointment because you’ll be working with someone certified in CMAs. Ask if your local Sephora has any social media pages. In a world where technology is taking over, of course everyone has social media—including your Sephora store. 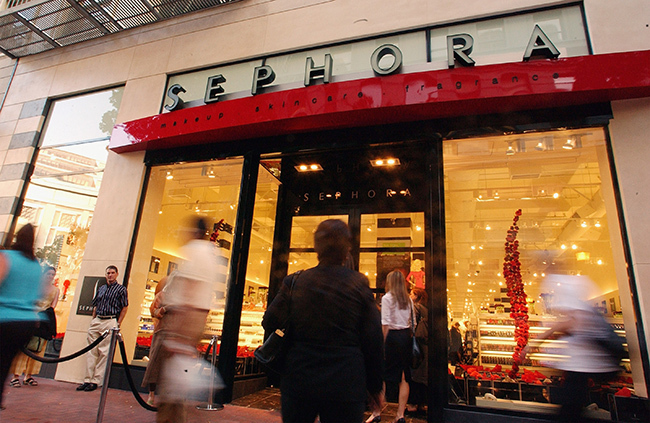 Not all, but many Sephora locations create Facebook pages, Twitters or Instagram accounts to keep their clients updated on what’s going on in the store. My store has an Instagram account where we show our clients the newest items as soon as we get them in and we also tell you all about the events we have coming up in stores. Always ask for samples at the register. We almost always have some sort of sample to give out at the cash wrap, but many times—especially when the store is super busy—we forget to put one in your bag so simply ask if there are any samples and it gives your Product Consultant a quick reminder to toss one in your bag!